Are You Ready For Facebook’s Downfall? Facebook is falling! Facebook is falling! its peak user base by 2017. This is no glib Chicken Little forecast. Rather it’s real research conducted by real rocket scientists, John Cannarella and Joshua A. Spechler, from Princeton’s Department of Mechanical and Aerospace Engineering in their article, “Epidemiological modeling of online social network dynamics”. Cannarella and Spechler used epidemiological models to explain social media user behavior where adoption was analogous to infection and abandonment was analogous to recovery. 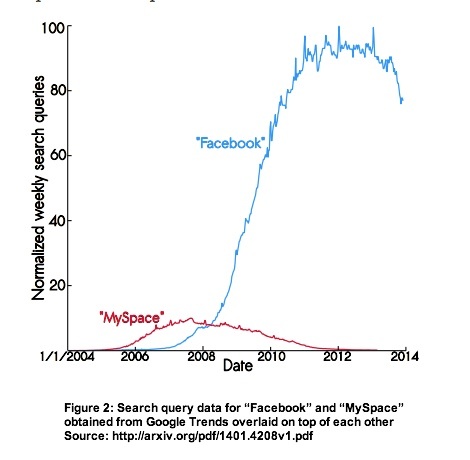 Using MySpace search query data the researchers created an initial model and then applied it to Facebook query data. Their model suggests Facebook has already reached the peak of its popularity. 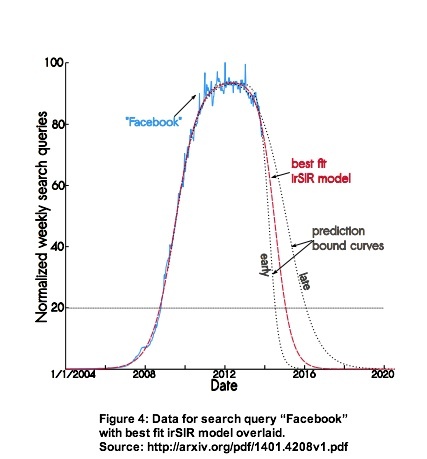 They conclude that Facebook has entered a decline phase, as shown by a downward trend in search frequency since 2012. Extrapolating the best ﬁt model into the future, they predict Facebook activity will rapidly decline over the next few years. Teens. Once the standard bearer for this social media platform, teens are leaving in droves. While they may check Facebook to keep their finger on the pulse of what’s happening, it’s not a cool place to spend their time. 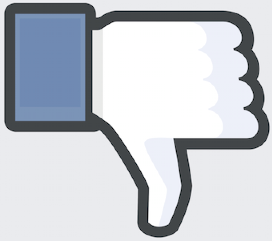 Facebook has lost an eye-popping 60% of teen members – or over 11 million high school and college-age members over the past three years according to iStrategyLabs, a market research firm. Mobile. Half of Facebook’s user base is already on mobile where advertising space is limited. This means users are snacking on information from the social network when they have free moments on a WIIFM (What’s In It For Me) basis. Therefore if your content isn’t of value or entertaining to them or their colleagues, it’s gone. Me-too products. For a population that craves the new-new thing, Facebook is now the home of me-too products offered via their wildly popular app, Instagram. Legal troubles. In a December 11, 2013 ruling by US District Judge Robert Sweet reported by Reuters, investors can pursue claims that Facebook should have disclosed prior to its May, 2012 IPO, internal projections on how increased mobile usage would reduce future revenue. 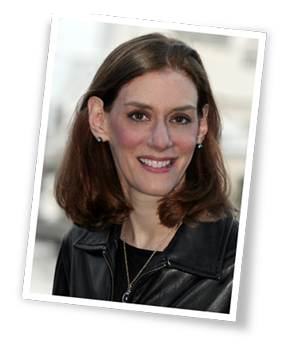 Among the defendants is Facebook COO Sheryl Sandberg. 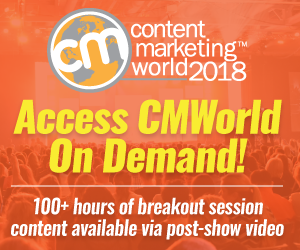 Here are 3 actionable marketing tips to help you prepare for Facebook’s diminish strength as a media platform for building your brand and delivering leads. Know where your target audience spends their time on social media. Track customer and fan activity on your Facebook page as well as other platforms. The critical factor is the trend; are the numbers going up or down. Where appropriate, get customer input. Diversify your presence on social media. Not to beat the chicken analogy to death, but don’t put all of your eggs in one basket. Don’t wait for the results from your Facebook efforts to decline. Proactively establish your business on a variety of social media platforms. Build your owned home base. Develop your own media entity. I’m not the only one saying this. So is Brian Clark of Copyblogger, who says the new key to business success is media, not marketing. (Update January 27: Chris Brogan said you need a home base in social media back in 2010. Further Facebook expert Jon Loomer made the case that building your business solely on Facebook was like building on rented land. ) Combined with the power of content marketing, this is a major reason that blogs will regain prominence over the next few years. While this data needs further verification, there’s other supporting research that shows Facebook usage is declining, especially among teens. As a marketer, take heed and start to establish your presence on other platforms. What’s your opinion about the future of Facebook? P.S. Please note while this research has yet to be peer reviewed; it’s received thousands of social media shares and hundreds of comments on different media sites. Social Media: Where Is Your Audience? Tags Facebook, John Cannarella, Joshua A. Spechler, Research. Bookmark the permalink. The fall of Facebook will soon happen yes, but by 80%? I believe Facebook is due to fall and is best this way. Why? It’s no longer a Walmart of all social media but more of a site to a certain kind of people. Pinterest, Twitter, Vine all have their niche and kinds of people. Facebook has always been simply good at everything until now. Who their audience will be I don’t know, but they better figure quickly. I think it’s own numbers has become it’s enemy and the algorithm within is what will destroy it. They have this flooded news feed and money decided which ones will be seen. Facebook says “Free and Always Will Be” Is that Really the case?? Not anymore. Google Trends is a silly measure for this study. It provides some cursory insight, but is by no means the only measure of “peak user base” – in fact, whether Google Trends actually provides insight into “peak user base” could be called entirely into question. It might rather indicate rate of new user acquisition, since these are numbers based on Google Search data. When was the last time the typical already-acquired Facebook user searched “Facebook” on Google? Of course, if they’re using the chrome browser, the cross-over nature of the search bar as where we type URLs may provide further insight, but which of us knows whether Google counts those queries? And if they did, how far back could they trust this data? Google Chrome was introduced in 2008, but their dataset goes back to 2004, so it must be from actual Google.com searches. And José Antonio Sánchez brings up the great point that this is a MARKET study. It isn’t as if Facebook is some static product with no team of developers anticipating future trends and trying to accommodate. They bought Instagram. They bought many other companies: http://en.wikipedia.org/wiki/List_of_mergers_and_acquisitions_by_Facebook. They are a major market force – the definitive leader in social networking. They have a lot of capital to work with. That trend prediction is thoroughly unimpressive. And trust me, I’m the first to advocate for other social networks over Facebook for marketing – Twitter and Pinterest primarily. But I can’t deny their scope. I think the whole conversation around this is entertaining. I have such a hard time believing that Princeton would release anything without peer review unless it knew what it was doing. Do you think it’s potentially a failed (although clever) attempt to draw in attention? In matters of life and business … there’s ALWAYS an agenda. LOL! Princeton’s methodology was silly. You can’t base a market study solely on Google Trends data.